Palestinians in Ramallah celebrate signing of unity agreement. On May 4, the Palestinian National Reconciliation Agreement was signed in Cairo calling for the creation of a unified Palestinian government. The central parties to the agreement were Fatah, the ruling party of the Palestinian Authority in the West Bank, and Hamas (Islamic Resistance Movement), the ruling party in Gaza. Twelve other organizations, including the Popular Front for the Liberation of Palestine, Islamic Jihad, Democratic Front for the Liberation of Palestine, and Palestinian People’s Party also signed the unity accord. The new Egyptian government played a key role in negotiating the agreement. Cairo has announced that it will open the Egypt-Gaza border, ending the Mubarak policy of collaborating with Israel and U.S. imperialism in maintaining the brutal blockade of 1.5 million Palestinians living in Gaza. Both the unity agreement and the expected opening of the border were made possible by the Egyptian revolution. Another important factor was the recent rise of a Palestinian youth-led movement holding demonstrations and other activities calling for unity. The rise of this new youth-based movement was in part inspired by the revolutionary uprisings in Tunisia, Egypt and other countries in the region. The response of the U.S. and Israeli governments to the agreement has been one of hostility, threats and demands. On May 9, Israel announced that it was suspending the turnover of taxes to the PA on goods shipped from Israel to the West Bank, which has caused 155,000 employees of the PA in the West Bank and Gaza to go unpaid. At the same time, while feigning dismay, many top Israeli leaders see the agreement as helping to justify their real policy of pretending to be for peace while grabbing more and more Palestinian land. The inclusion of Hamas, which the U.S. and Israel have labeled a “terrorist organization,” has served as a new pretext for the Netanyahu government to continue avoiding negotiations. Presidential, legislative and Palestine National Council elections will be scheduled one year after the signing of the accord. Fatah and Hamas will jointly agree upon the formation of an electoral commission and electoral court. Fatah and Hamas agree to form a Palestinian government and to appoint the prime minister and ministers in consensus between them. Affirmation of the role of the Palestine Liberation Organization as the representative of the Palestinian people. Whether or not Hamas will now join the PLO is not clear. Formation of a Higher Security Committee made up of officers decided by consensus. Click here to read the full text of the agreement. Implementation of the unity agreement faces significant obstacles, due in particular to the bitter conflict between the two principal parties in recent years. In January 2006, the Hamas party won a sweeping victory in elections for the Palestinian parliament, while Mahmoud Abbas, successor to the historic leader of Fatah, Yasser Arafat, continued as PA president. Conflict between Hamas and Fatah over control of Gaza erupted into armed struggle in June 2007, and ended with Hamas in control of the area. Since then, PA security forces—many trained in Jordan by the CIA and Pentagon—have collaborated with Israeli security in suppressing Hamas and other organizations in the West Bank. Reports say that as many as 300 Hamas prisoners are held in PA jails, and dozens of Fatah supporters are held in Hamas's Gaza prisons. The “Palestine Papers,” a collection of more than 1,600 documents dealing with Israel-PA-U.S. Negotiations, released by the Al Jazeera media network in January, revealed that PA negotiators had in 2008 offered to capitulate on all major points of dispute with Israel. The PA side indicated that it would accept Israeli demands on borders, Israeli settlements in the West Bank, Jerusalem, Palestinian refugee rights and other issues in order to obtain a truncated “state.” The revelation of the PA’s “generosity”—supported by the U.S. government, which has provided hundreds of millions of dollars annually to the PA —was highly embarrassing and compromising for the Abbas administration. Another factor in Abbas’s decision to seek a unity agreement was the U.S. veto of a U.N. Security Council resolution condemning Israel’s ever-expanding settlements in the West Bank—despite the fact that the U.S. official position opposes the settlements. The settlements are clearly in violation of international law and have been widely denounced by virtually all international bodies. The wording of the resolution that the U.S. delegate voted against was taken from a speech by Hillary Clinton condemning continued settlement building by Israel. The isolation of the U.S. was illustrated by the fact that the Security Council vote on Feb. 18, 2011, was 14-1, with even U.S. allies and client states in that body voting in favor. The Obama administration did not want to be put in position of being the lone negative vote, especially given the rapidly spreading upheavals in the Arab world. To avoid that eventuality, the administration had brought heavy pressure to bear on Abbas to call off the vote, threatening him with a cutoff of aid and other consequences. But given the futility of many earlier concessions and attempted concessions to obtain even a semblance of a state, the PA government had begun to go in a different direction. The strategy of relying on the U.S. as the only power that could force Israel to concede a Palestinian state—the basic doctrine of the PA since the 1993 Oslo Accord—had come up empty. 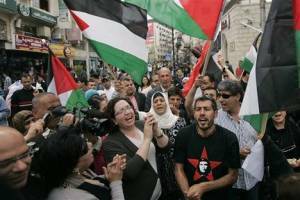 Since last year, the PA had been carrying out a campaign to obtain international recognition of an independent Palestinian state, limited to the West Bank and Gaza, with its capital in East Jerusalem, with the aim of bringing Palestinian statehood to the United Nations in September, 2011. The so-called “two-state solution” has been historically opposed by other Palestinian organizations like the PFLP, which calls for a democratic secular state in all of Palestine and the right of return for Palestinian refugees. Another important factor in the shift by the PA was the fall of the U.S.-backed Mubarak regime in Egypt. Mubarak supported the Abbas government and treated Hamas, which was originally a branch of the Egyptian Muslim Brotherhood, as an enemy, maintaining the southern end of the blockade of Gaza for many years. Mubarak was a key figure in the three-way alliance of U.S. imperialism, Israel and the reactionary Arab regimes, which suppressed the Palestinians and the Arab masses as a whole. The Egyptian people who rose up against Mubarak were also overwhelmingly opposed to the blockade of Gaza and this is reflected in the new government. The turn toward unity with Hamas, about which Abbas reportedly did not inform the Obama administration ahead of time, was deemed necessary to strengthen the PA’s position both internationally and vis-à-vis Israel. The leader of Hamas, Khaled Mashal, declared that his organization would observe an immediate ceasefire and a long-term truce with Israel in exchange for the creation of a Palestinian state in the West Bank, Gaza and East Jerusalem. The response by Secretary of State Clinton was telling. She demanded that in order for the U.S. government to enter into any talks with the newly unified Palestinians, Hamas would have to renounce violence, recognize the state of Israel and agree to carry out all previous agreements between Israel and the PLO. Similar demands are never placed on Israel. With the massive firepower provided by U.S. imperialism, Palestinian casualties over the past six-plus decades have outnumbered those on the Israeli side by a factor of close to 10 to one. In “Operation Cast Lead,” the Israeli assault on Gaza in 2008-9, Palestinian casualties were 100 times those of Israelis. As a colonial-settler state, Israel has never recognized the most basic rights of the indigenous Palestinian people, including their right to live in their own homeland. And since the signing of the Oslo Accord, Israel has continually trampled on the terms of even that dismal (for the Palestinians) document. The situation for the Palestinians in Gaza has been extremely difficult since the creation of Israel and the massive refugee camps 63 years ago. The inhuman blockade and frequent Israeli assaults have been directed against one of the most densely populated areas of the world. Ending economic and political isolation is imperative for the Hamas government. While many questions remain about how the unity agreement will be carried out, it has been hailed by Palestinian organizations across the political spectrum as an important step forward. Very different responses have come from the U.S. and Israel. Since the Oslo Accord in 1993, their fundamental strategy has been to promote civil war between Palestinian factions as a means of destroying the resistance movement altogether. Thus, both U.S. and Israeli leaders view the new agreement as a setback. The U.S. government has issued new demands on the PA and also threatened to cut off hundreds of millions of dollars in aid, while at the same time not categorically ruling out future talks. The quandary for the administration is that taking more belligerent steps could undermine a project in which it and its predecessors have invested a great deal of time and money: turning the PA into another client in the region. The context of upheavals throughout the region can only heighten concern about such an outcome.